This tree in Colorado ‘Frontier’ blazes a trail for elms in the urban landscape. 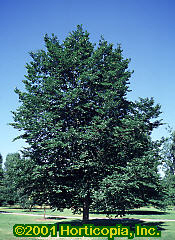 Frontier Elm was hybridized in 1971 by the USDA research station in Delaware, OH. In field evaluations, it has not flowered so it may be sterile. Frontier Elm is reported to be tolerant to Elm yellows and DED but has shown some Elm leaf beetle damage. The leaves are small and turn a nice red-purple in the fall. The form is upright and works well as a street tree. As is true of the genus, Ulmus Frontier Elm is highly soil adjustable. Significance ‘Frontier’ represents the first commercial release of an elm cultivar with spring-flowering (U. carpinifolia) and fall-flowering species (U. parvifolia) as parents. 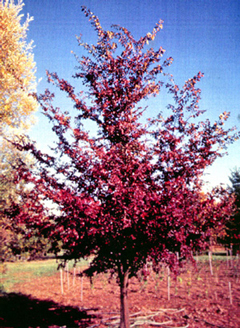 A small to intermediate sized tree with unusual red-purple fall color, this hybrid elm exhibits both a high level of disease tolerance to the fungus that causes Dutch elm disease and moderate resistance to the elm leaf beetle in laboratory and field tests. In addition, ‘Frontier’ appears highly tolerant to natural infections of elm yellows. Released 1990. Hardiness Zones 5 to 8. 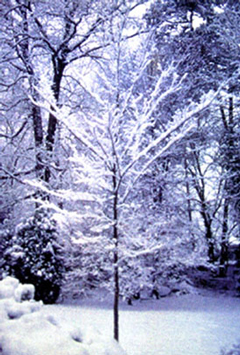 Growth rate Small to intermediate sized, single trunked, upright-pyramidal deciduous tree. Symmetrical shape. Faster growing than male parent, U. parvifolia. 25 feet tall and 15 foot crown spread at 19 years under sod culture. Foliage Glossy green, changing to burgundy in fall. Fruit Rarely flowers, no seed production observed.